But it hasn’t always been that way. Palliative and hospice specialists have been caring for cancer patients for decades. Oncology specialists have been implementing palliative principles before we used that term. However the Palliative Care in Oncology Symposium deliberately and publicly cemented this relationship in a way that has not been done before. Sponsored jointly by ASCO, ASTRO, MASCC and AAHPM, the symposium aimed to merge the key elements that each field uses in their approach to improved patient care. We (an Oncologist and a Palliative medicine physician- AKA Palliatrician) attended this symposium with the goal of improving our own collaboration. As colleagues, running partners and research partners, we often laugh about our different approaches to patient care, and sometimes life, that are rooted in our respective specialties. When comparing our annual meetings, with the ASCO meeting presenting multitudes of p-values and the AAHPM meeting highlighted each year by a tear-jerking memorial service, it must have been a daunting task for the steering committee (made up of Michael Fisch, MD, MPH (Chair), Dorothy Keefe, MD, Traci Balboni, MD and J. Cameron Muir, MD) to marry the two approaches. When 700+ practitioners, including physicians, nurses, social workers, psychologists, dieticians, nurse practitioners, administrators and patient advocates packed into the designated conference hall (it was full to capacity because the organizers adjusted to accommodate a higher than expected attendance) we were greeted to an opening introduction that was akin to a long awaited wedding ceremony. Michael Fisch reflected on the history of both Palliative and Oncologic medicine that paved the way to the point we have reached, emphasizing the barriers that have been overcome by many of the people who were in attendance. And, like a marriage of two families, the remainder of the meeting celebrated the union but also pointed out the differences and room for growth. Jamie Von Roenn MD, who was recognized as the driving force behind the symposium, described the ASCO perspective why palliative care is a necessary component of oncology care, stating “Palliative care always, anticancer therapy sometimes”. She firmly believes that every oncologist needs to know how to do primary palliative care and advises that oncologists need to be clear about reasons for treatment- with patients and with themselves. She clarifies that palliative chemotherapy is only palliative if it is helping a symptom. Stephen Sonis DMD, DMSc on Predicting risk in treating cancer pain- Determining genetic pre-diposition to side effects and symptoms that will soon help us to tailor symptom management. Jeannine Brant PhD, APRN, AOCN on Electronic integration of patient reported outcomes- The need to better elicit patient reported outcomes through electronic patient input, emphasizing that when oncologists elicit symptoms in person, they miss a lot, particularly psychosocial distress. Patrick Mantyh PhD, JD on Mechanisms of cancer pain- Presenting the evidence that Early cancer pain management is imperative to preventing sensory nerve sprouting, and worsening pain down the road. 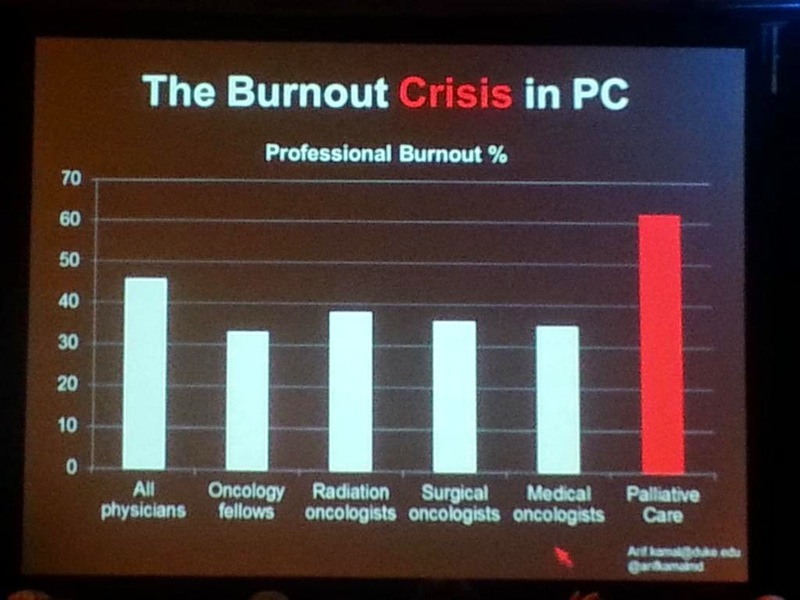 A survey of burnout in palliative care providers by Arif Kamal, MD showing that more than 60% palliative care providers report high burnout, a number that is significantly higher than other specialties, despite our intentional emphasis on humanizing medicine and employing self-care techniques. Burnout was correlated with isolation from colleagues and long hours. A Palliative/Oncology Co-rounding system described by Richard Riedel, MD resulted in decreased length of stay and re-admission to the Duke inpatient cancer unit. His team emphasized the personal tailoring of this model, since the team decided whether patients needed the Palliatrician, the Oncologist or both, on a daily basis. A survey on resident code status discussions by medical student David Johnson Einstein showing resident physicians are unlikely to share the poor prognosis or offer specific recommendations on CPR in treatment-refractory cancer because of a perceived conflict with patient autonomy. A description of an automated symptom reporting system for hospice patients was described by Kathi Mooney PhD, RN, FAAN, showing evidence that daily automated reporting of symptoms by caregivers resulted in improved symptom management and caregiver vitality. With the emphasis on increased research in palliative/oncology care, the session on funding and research for palliative in oncology was well attended despite the allure of lunch. Highlights included the emphasis from both Lynne Padgett, PhD (NCI Health/Behavior research program) and Ann O’Mara PhD, RN to contact them directly when developing proposals. NCI received more than 8,000 proposals last year and funded 14% of them, so the application, the study and the applicants must all be stellar. Anthony Back, MD whose mission is to improve communication skills, gave an entrancing presentation, as expected, emphasizing that good communication takes practice and a framework. He used the metaphor of a jazz musician who has trained so well that even their improvisations are beautiful- the good communicator can handle the difficult situations only because of practice. BJ Miller MD offered a complimentary session emphasizing incorporation of the arts and philosophy to “make life more wonderful” not just for our patients, but for ourselves as well. Charles Von Gunten MD PhD presented the perspective he has gained while working to incorporate palliative care into oncology care in Ohio and made us all laugh with a satirical video like this one. He noted that local institutions often need to see their own data before accepting and acting on national data. Traci Balboni MD MPH discussed palliative care in radiation oncology, where she finds that symptom burden is high, with more than 40% of patients receiving non-curative treatments. She highlighted that although 1 (to up to 10) fractions of radiation are adequate to treat bony pain from metastases as per Choosing Wisely, nationwide over 50% of patients receive greater than 10 fractions potentially leading to greater side effects, precious time away from family at end of life, and decreased quality of life. She also comments, repeatedly, that palliative education is limited in Radiation Oncology training programs, something that she wants to see change. Deborah Jane Dudgeon MD- Reflected on The Cancer Care Ontario Integration Experience, recommending standard use of the Queens’ ESAS and sharing that over 61% of regional cancer patients in Ontario are now being screened. Also recommends that the term “active” care be abolished due to its unintended message. for patients as their needs dictate, much like targeted therapies for lung cancer. Tracy Balboni MD MPH was tasked with speaking for our spiritual care colleagues, during which time she shared evidence that attention to spirituality is desired by patients and results in increased quality of life, increased hospice use and decreased costs. Harvey Chochinov MD PhD delivered an elegant discussion of his work on dignity therapy, where he has found that patients’ perception of their appearance significantly affects their dignity and dignity correlates positively with good symptom control and patient satisfaction. James Zabora ScD Reflected on the difficulty of measuring psychosocial distress, showing that the NCCN Distress tool is an adequate screening tool but misses 50% of distress that BSI-18 identifies. 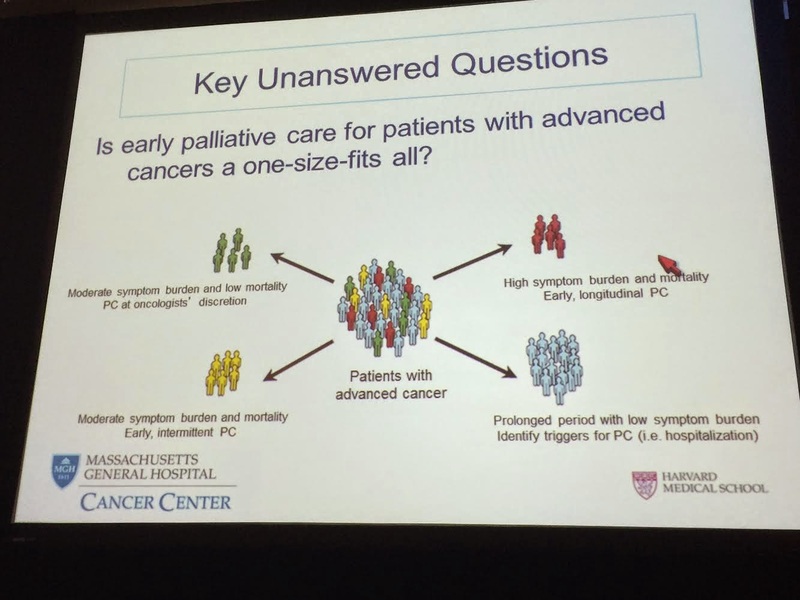 While most presenters implied or stated that palliative care has potential benefit for patients across the continuum of care, Dorothy Keefe MD provided the controversial view from MASCC that palliative care has a specific role only in advanced cancer patients, preferring the unique terms/models of ‘supportive care’ and ‘survivorship care’ for the remainder of patients. Julienne Bower PhD discussed the debilitating fatigue survivors can experience how it is under-reported, under-treated and may persist for months or years after treatment. She has some evidence that inflammatory cytokines are involved. See also ASCO Guidance Recommendations for Fatigue. Tim Ahles PhD commented on the predictors cognitive impairment after chemotherapy, including children under 5, high dose chemotherapy, and treatment for brain treatment. Interestingly, 20-25% of breast cancer survivors had cognitive impairment even before adjuvant treatment and 15-30% have it afterward. N Lynn Henry MD PhD commented on the difficult problem of aromatase inhibitor-associated Musculoskeletal symptoms (AIMSS), suggesting AI switching, duloxetine, vitamin D, acupuncture and exercise as possible interventions although none are standard of care. Our palliative leaders have knocked on the door for years. To be invited in, we have to bring data.